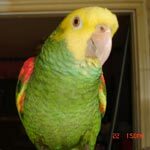 Parrot Forum • View topic - help me!! i cant get rid of the logo because you need to pay for that and your very welcome. No need for that, I am happy to be able to see them. Thank you very much for that. Birds like things that are exciting. One of the first things my red belly said was "peek a boo" My daughter and i would hide behind the wall and then show ourselves and say peek a boo. The way the red belly says peek a boo it sounds like two people talking. Of course we would laugh and say peeka boo back and this would excite her more and she would copy our laughing. We did our best to ignore her when she copied the smoke detector. Once they are talking they copy mostly excitig things or often repeated things they like. I can always tell who she is copying by the voice she uses. When I am busy looking at my phone and I hear " Hey Gaugan, What are you doing?" sure enough she is getting into something she shouldnt. You never know for sure if a bird will talk, but the best thing to do is to talk to them a lot. Use a tone they like or are excited by. Even if they dont talk you are establishing communication with them, and that is the most important thing. Based on my own experience I find it easiest by saying things as you do them. give her a second to process what you said then do it again. do this ten or so times, and say it enthusiasticlly, this encourages them to copy, do this everymorning untill she begins to ramble while you do it. when she does this treat her and say goodmorning again encouraging her to continue. This might take a while, more than a month even, but once they get their first word, the rest seem to become easier. Just from repititon Tilly says step up. and it is quite funy cause she'll go "Good mornin good girl, *whistle* step up stepup pretty little girl, good, silly tilly,c"mon step up.." ect. She just mixes up all her words to make a story. Its pretty cute. Best of luck and hope this helped! Last edited by Chantilly on Mon Nov 02, 2015 3:50 am, edited 1 time in total. They learn like little kids. They can be as stubborn as kids. Mine won't say good morning. They only say I love you when they think I am angry. Aww! I can Imagine that would be pretty cute!